Trinity Business School is ranked 1st in Ireland and 37th in the world by Eduniversal rankings. The new Business School Campaign allows Trinity to take a very high performing institution, double its scale and deliver one of Europe’s top Business Schools in the heart of Dublin. The leadership and support of a community of over 30 leading local and international business people means that Trinity will be building a major international Business School focusing on entrepreneurship and innovation. 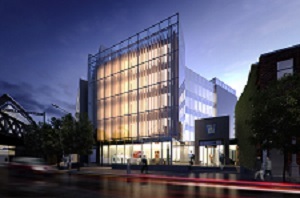 The state-of-the-art development will open onto the rugby pitch in College Park on one side and Pearse Street on the other, connecting the Business School directly with one of the most successful innovation clusters in Europe. You will see great changes over the coming months on campus as we make way for the state-of-the-art School. Construction began in July 2016 and the new building will be completed in 2018. Our sincere gratitude to the many alumni and friends who have been so extraordinarily enthusiastic and supportive in helping make this big ambition a reality. Visit the Trinity Business School website to learn more about the Trinity Business School or email Deirdre Tracey. Alternatively you can contact Deirdre by phone on +353 1 896 2088 if you would like to learn more about how you can get involved.